Artificial Sweeteners are TOXIC !! Aspartame is digested and converted into formaldehyde in the body !!! Check out this article from the front page of The Dominion Post newspaper June 21st 2007. Dr Woodrow Monte, now retired Professor of Food Science, Arizona State University has an excellent website with research, articles, documentry videos and more... All about the Dangers of Aspartame. 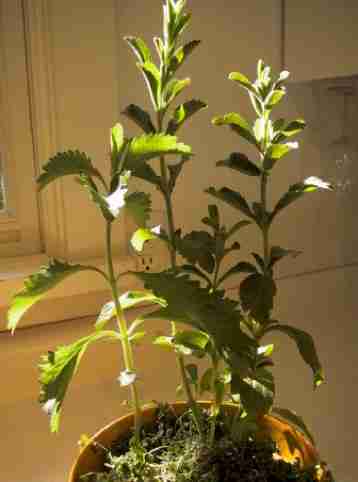 Here are pictures of stevia plants. There are no toxins here, just old fashioned nature. You can pick a fresh leaf and drop into a cup of tea or coffee for a sweetener, or dry them for use in drinks, baking etc.